Shrule Castle was built in the early part of the 13th century by the Norman de Burgh family. It was granted to John de Burgh in c.1308 by his father Richard be Burgh, the 2nd Earl of Ulster. 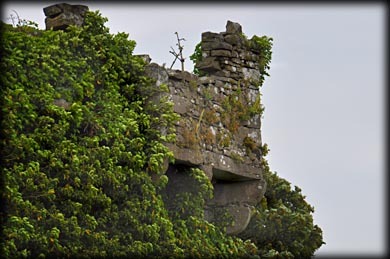 The castle was attacked in 1570 by english forces led by Sir Edward Fitton, the first Lord President of Connaught, 1569-1572. In 1642, during the Confederate Wars, a number of English settlers surrendered to Irish authorities. After being kept at Shrule Castle for a week, Lord Mayo handed the settlers over to Edmond Bourke for transportation to Galway. On the bridge at Shrule, Bourke ordered his soldiers to kill all the settlers. It is known as known as the Shrule Massacre. 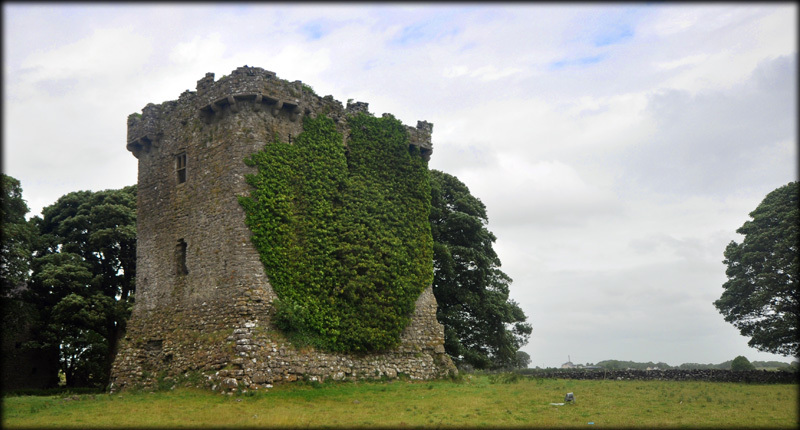 The castle was held by William Burke in 1574 until it was taken over by his son John in 1610. It is a three storey hall house, with four really impressive corner bartizans at the upper angles. It also has a very pronounced base batter. The, now robbed out, doorway was in the east wall. The weather was awful during my brief stop here, so apologies for no interior images, but I do hope to return to this part of Mayo soon. 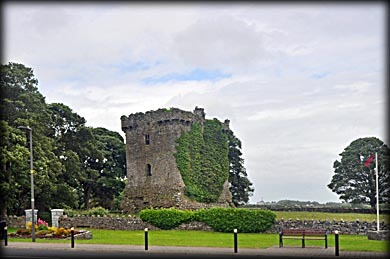 Situated: Very easy, Shrule Castle is located in the middle of the town, on the east side of the N84. Discovery Map 38: 2798 5272. Last visit June 2017.